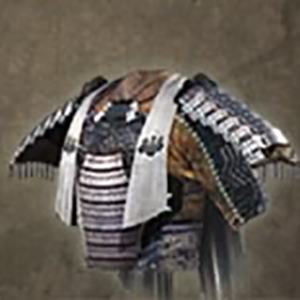 Armour of the Rising Sun: Do is a Torso Armor in Nioh. "Upper body armor featuring a double-plated design and adorned with white lacings.Its simple strapping, though time-consuming, affords the armor its trademark brilliance. Part of a traditional armor set known as Tosei-gusoku in Japanese, this armor is said to have belonged to Toyotomi Hideyori after he succeeded Toyotomi Hideyoshi at Osaka Castle as ruler of the land. It resembles the armor worn by Hideyoshi and gets its name from its radiant design, which resembles that of a rising sun. The bright silver steel with white threading gives the armor an air of nobility and envelopes those who wear it in an empyreal light. Its construction is befitting of the leader of the Toyotomi clan, however it was not as commanding when worn by Hideyori, as he was merely a puppet of Yodogimi."